Anamaya Resort, a luxury Yoga Retreat, nestled on a cliff edge in Montezuma. This exotic resort is surrounded by lush green rainforest of the beach town and overlooks irresistible beach views. From the resort, there are some popular waterfalls of the area within a short distance. This resort offers 28 days/200 hours long yoga teacher certification courses all around the year and you can develop your skill by taking this courses. If you take this training session, you will also enjoy other facilities including comfortable accommodation, three organic gourmet meals per day, tours and many yoga classes and these yoga programs are perfect for becoming a certified Yoga teacher. Located in the surfer’s sanctuary, Dominical, Danyasa Eco Resort and Retreat offers many yoga workshops, teacher training programs. This resort not only offers yoga courses but also offers many healing mentoring, dance classes, bodywork, tours and excursions. People who are advanced in yoga and want to develop their career by taking Yoga as a profession, they can take the 100 hour Yoga Teacher Training and immersion program offered by this retreat center. After completing this training program, the practitioners will be eligible for Yoga Alliance Certification. While staying at this center, you will also learn the three E’s of Danyasa Arts: Embodiment, Empowerment and Expression. This resort can accommodate maximum 24 people so it is recommended to make reservation. Set just two minutes drive from the beach, this resort is formally known as “Bamboo Yoga Play”. A Yoga Alliance Registered School, Marianne Wells Yoga School is located in Cahuita (a small town in Costa Rica). 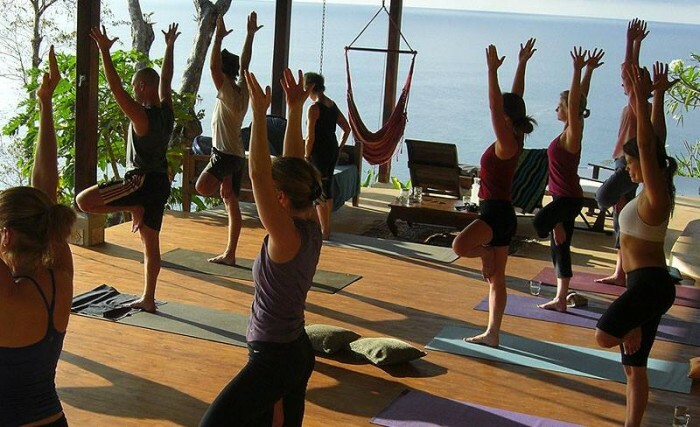 In Costa Rica, this yoga school is considered as one of the most popular yoga schools. If you are interested in taking Yoga as a profession, you can join the 200 Hour Yoga Teacher Training Program offered by this school. Comprehensive yoga teacher training programs are offered by this school. After completing this yoga teacher training program, one can start career as a Yoga teacher. For the participants, this school also offers other facilities including comfortable accommodations, gourmet meals and a panoramic ocean-side setting. All the meals are prepared with organic ingredient and there vegetarian dishes are also available thrice a day. While staying at this school, you will also enjoy other facilities including ground transportation, fresh linens, daily maid services and many more. It is a Yoga Alliance Registered Institute in Costa Rica. Founded by Don Stapleton and Amba, this institute offers a variety of Yoga session including YTT program. All the classes are directed by Internationally recognized as professional Yoga teachers. This institute is renowned for its professional Yoga Teacher Training programs. People who are interested in becoming qualified for Yoga Alliance Certification, they can take the YTT program offered by this institute. This institute offers daily Yoga classes with training manual, 2 meals per day and comfortable accommodations with the Yoga Teacher Training programs. Situated in Pavones, on the southern Pacific coast of Costa Rica, Pavones Yoga Center is a Yoga Alliance registered school. This center offers Yoga Teacher Training programs with all the requirements and Internationals standards. Two types of YTT programs: 200 hours multidimensional yoga teacher training and 300 hour advanced yoga teacher training are offered by this center.If you complete this training session, you will be qualified to become registered professional Yoga Teacher with Yoga Alliance certification. These training session are usually designed for maximum a group of twenty one people so that the instructors can give enough attention to the practitioners and instruct them to learn properly. While staying at this center for the YTT program, you will also enjoy comfortable accommodation, yoga classes and also delicious meals with the training programs. Situated on the Southern Caribbean Region of Costa Rica, Samasati Nature Retreat offers several Yoga workshops, training programs. All the yoga programs are carried out by Hari Om Yoga School. Yoga classes are designed with breathing exercises, yoga postures, meditation, anatomy, philosophy, history, chakras and tantra. These courses are customized with Physical and Spiritual training sessions. While staying at this retreat center you will enjoy yoga classes twice a day and the classes are usually last for two hours. You will also enjoy 5 hours long lecture in the morning and afternoon.